I'm a little late with my #NeomHappy100 update (See week 1) so I thought I would write a short roundup and also discuss a topic that I'm really into. The past week was honestly one of the worse I've had in a long time - A mixture of unpleasent visits to the doctor, combined with a demanding work week and everything else in-between left me feeling pretty defeated. 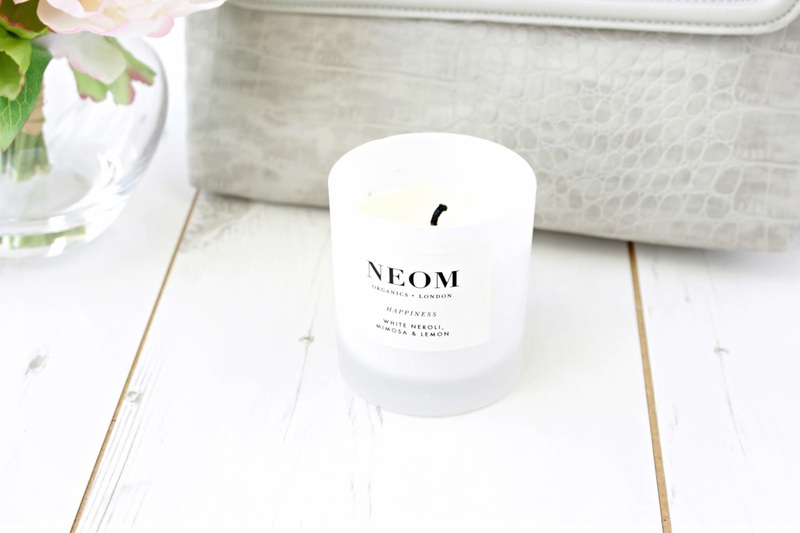 I've been relying on the Neom Happiness Programme to pick me up and I've been enjoying the comforting and uplifting scent of the Happiness Candle. I've also become pretty infatuated with the "Great Day" Mandarin & Mint Scrub... which has lifted my mood each and every time I've used it. So, onto Mindfulness - A few years back my anxiety had got to a point where I had to make a decision. To get better or to spiral downwards. Not many people actually knew how bad my anxiety was, as I would hold it in and wait until bed to cry (what seemed like a river) I decided to seek help and went to a brilliant therapist who gave me my master tool, mindfulness. So what is it? Mindfulness is a mental state that can be achieved by focusing your awarenss on the present moment combined with the acknowledgment and acceptance of feelings, thoughts and sensations. An example for me is the feeling of rain, I will often go outside for a few moments if I'm feeling a little anxious and I will focus soley on the feeling of the rain hitting my skin, how fast it's hitting my skin and the sound of it hitting the garden shed. Mindfulness practices have Buddhist origins and have been around for thousands of years, but it has become more of a modern treatment for people suffering with stress, anxiety and depression. For me it has been my saving grace and has allowed me to accept my anxiety and deal with it in a much better way. So my minfulness practice for this evening is going to be using my Great Day Body Scrub in the bath - I plan to focus on exactly how the scrubbing feels, as well as breathing in the beautiful scent along with noticing the feeling of washing it off. It might sound random, but resting your mind for a few moments with minfulness techniques can feel like a holiday! I'm excited for week 3 of the programme and I will be sure to update you at the end of the week. I would love to hear from you in the comments section below, each and every comment really does put the biggest smile on my face! I found this so interesting to read! I struggle with anxiety and depression and I find it really hard to concentrate on something to make me feel better. All I really do is take long, slow breaths but I think to make your mind focus on something so much would be a great way and distraction. Thank you for sharing this. Mindfulness is so helpful! I struggle to use it all the time because concentrating on it is so difficult but I went on a mindfulness course last month and came out of it feeling AMAZING!